Tópico em 'Notícias & Recomendações' criado por martec em 05/12/2013, 07:44. Sinopse MAL: The "new sibling romantic comedy" revolves around Masamune Izumi, a light novel author in high school. Masamune's little sister is Sagiri, a shut-in girl who hasn't left her room for an entire year. She even forces her brother to make and bring her meals when she stomps the floor. Masamune wants his sister to leave her room, because the two of them are each other's only family. 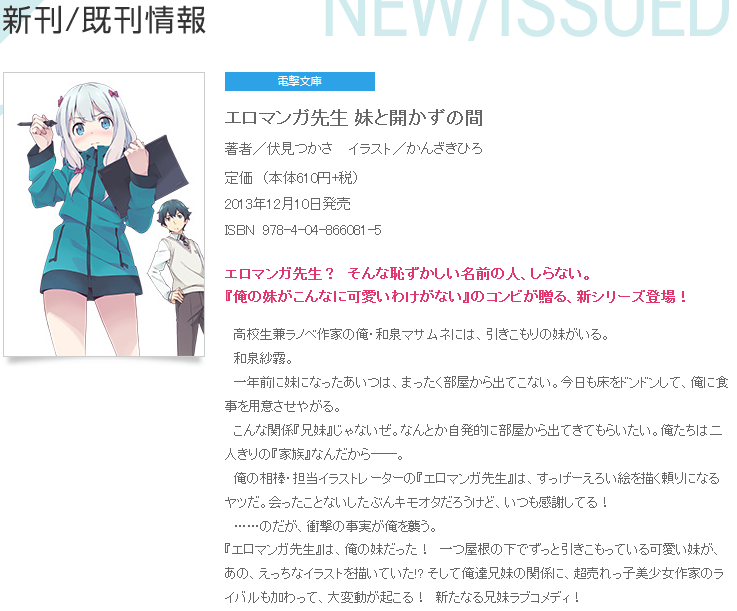 Masamune's novel illustrator, penname “Ero Manga Sensei,” draws extremely perverted drawings, and is very reliable. Masamune had never met his illustrator, and figured he was just a disgusting, perverted otaku. However, the truth is revealed … that his “Ero Manga Sensei” is his own younger sister! To add to the chaos that erupts between the siblings, a beautiful, female, best-selling shōjo manga creator becomes their rival! Adicionando à lista negra... OK.
(06/12/2013, 13:47)jihox Escreveu: Adicionando à lista negra... OK.
Bem, as chances dessa obra ter um protagonista macho são tão baixas que isso não é nem cogitável. Mesma coisa de Oreimo. Só mudam os personagens e a premissa. Esse autor só pode ser siscon inveterado. (06/12/2013, 22:46)Metroid Escreveu: Mesma coisa de Oreimo. Só mudam os personagens e a premissa.